Our last day in India and what better way to spend it than at the Taj Mahal. 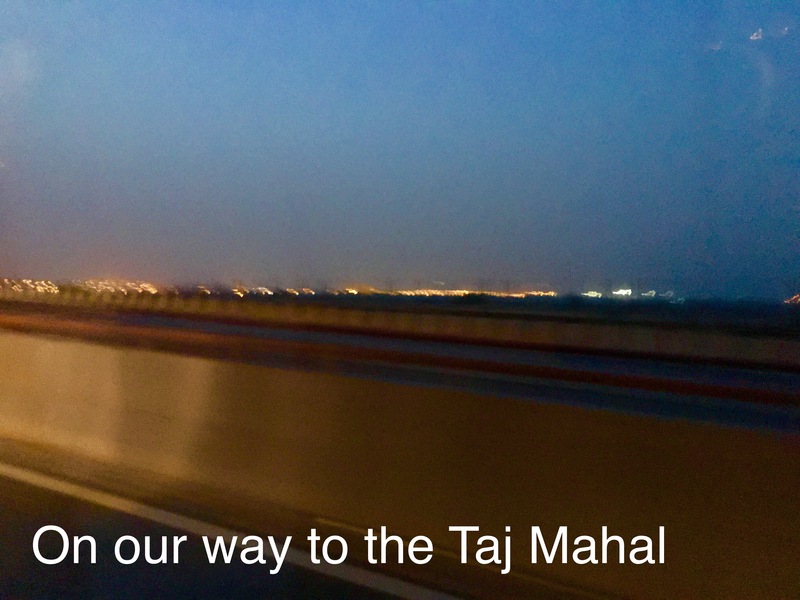 A very early 5am start from our accommodation in New Delhi meant that with a bit of luck, we’d beat the traffic, the heat, and the crowds and also ensure enough time to shower and change before making our way to the Airport for the flight home that night. 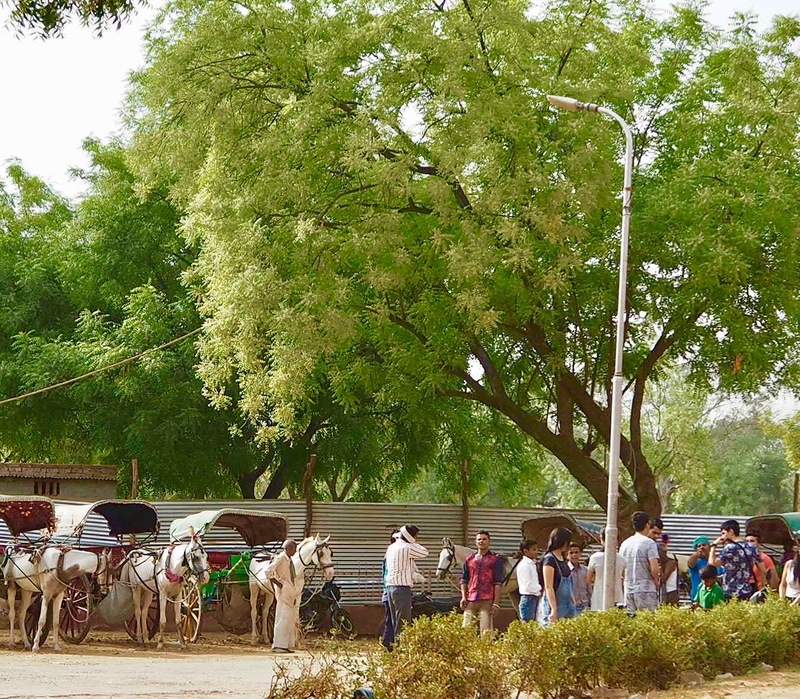 Agra was a welcome sight at the end of the long bus ride that necessitated a coffee stop along the way. Not exactly Starbucks, but not bad compared to the coffees I’d had over the past two weeks. The tea drinkers loved the variety of teas in India, but sadly, good coffees were not to be found, anywhere. Before we could get close enough to the magnificant buildings, we had to negotiate our way through the maze of vendors selling guidebooks and a range of memorabilia and souvenirs. As if by magic, a golf-buggy pulled up beside us and we were ushered in for the drive down the boulevard towards the entrance. I had spotted the horses lined up across the road when we arrived and was a little disappointed that we couldn’t be driven down the boulevard in style instead. But the golf-buggy was fine and it delivered us safely into the hands of more vendors close to the entrance. 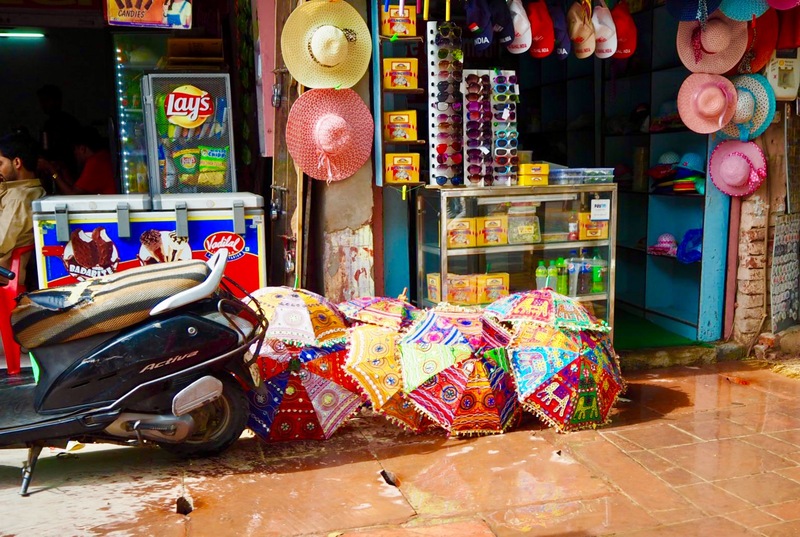 Since I hadn’t packed a hat for the excursion, some brightly coloured umbrellas caught my attention. My stray gaze towards them wasn’t wasted on the seller, who proceeded to pursue me while bartering the price, which had dropped to a mere Rs 100/- by the time I’d caught up with the rest of our group at the entrance. 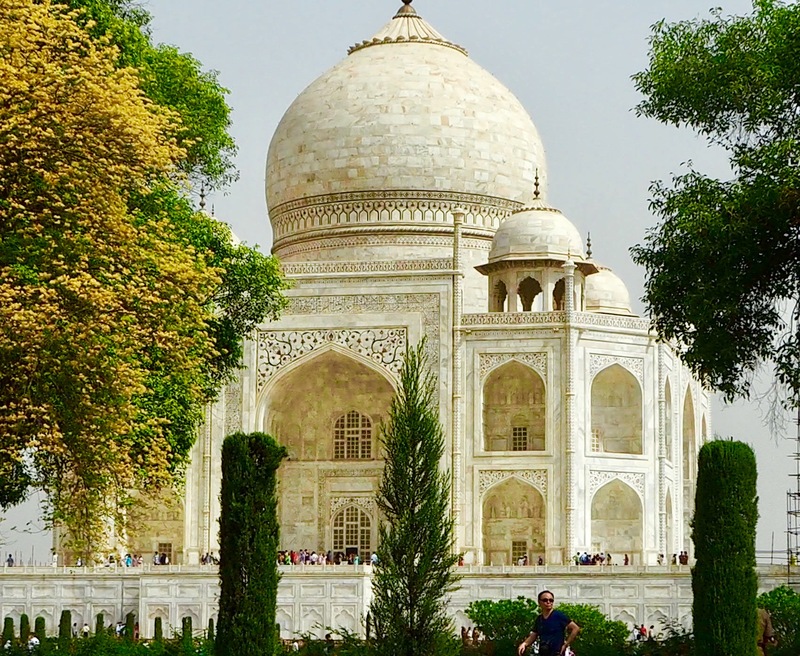 Money was quickly exchanged and I was assured of a shaded walk around the Taj Mahal. Once we were through the security formalities we were free to wander, as long as we met back at the gate at the designated time. The thought of having to be at the Airport later in the day for the flight home was forefront in my mind. 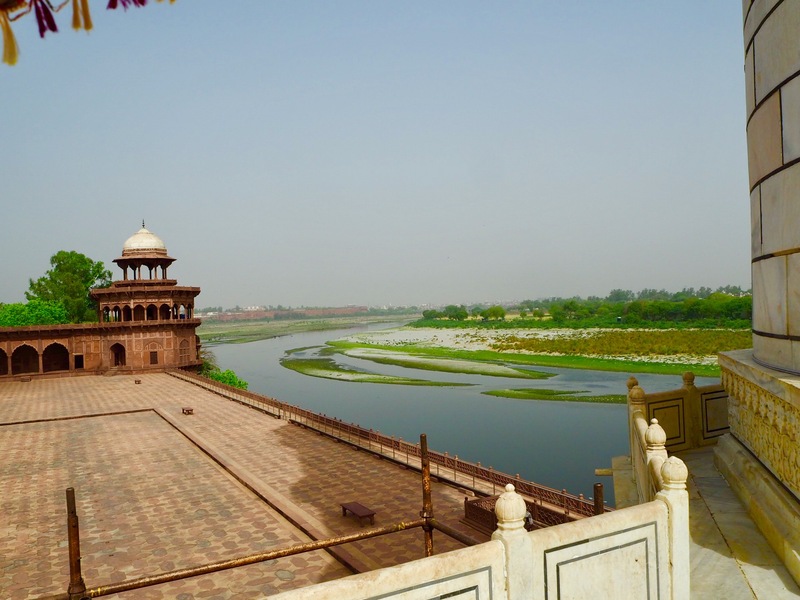 I’m not the most relaxed traveller when it comes to the day of flying to or from a destination, and being a few hours from New Delhi made me nervous enough to make sure I would be where I had to be, at the right time. The next few hours consisted of taking photos and just being in awe of actually being in and around such a famous World Heritage site. Words can’t do justice to the age and beauty of the structures. I think the Indian Government has it right with the entry fee. Locals pay Rs 40/- and tourists pay Rs 1000/-, although the ride to the entrance is only included in the tourist fee. 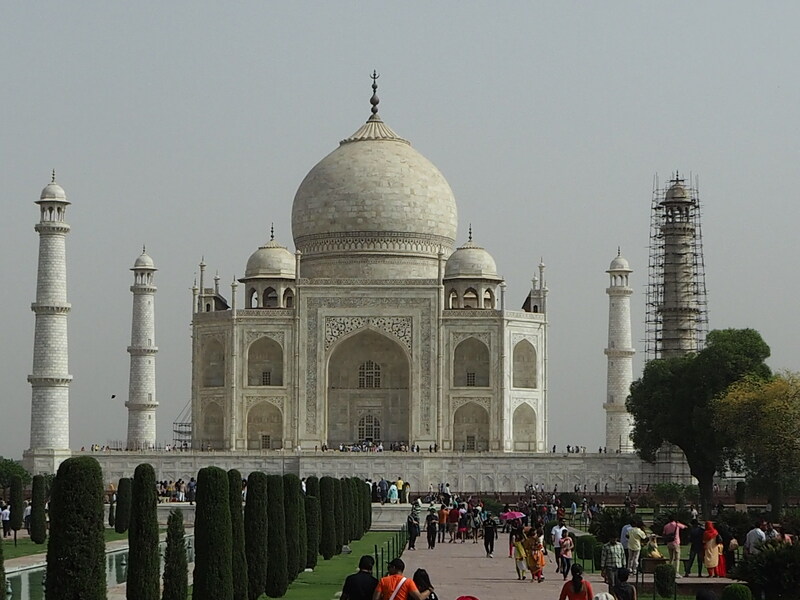 The beautifully romantic story behind the design and construction of the Taj Mahal in the 17th Century is far better explained on the Indian Government site than I could recount here. 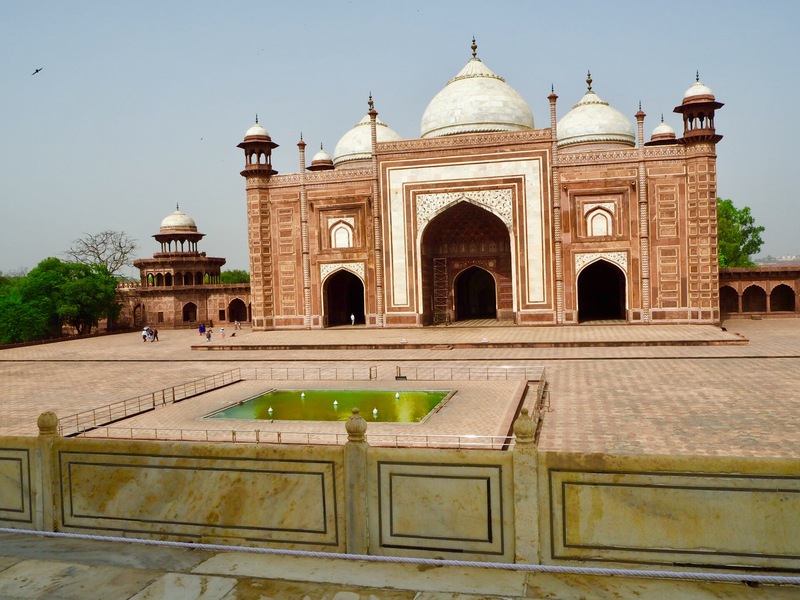 Since photos are not allowed inside the Taj Mahal, for obvious reasons, the following photos only depict the outside and surrounding buildings. And these photos can’t possibly do justice to the feeling of actually being there. 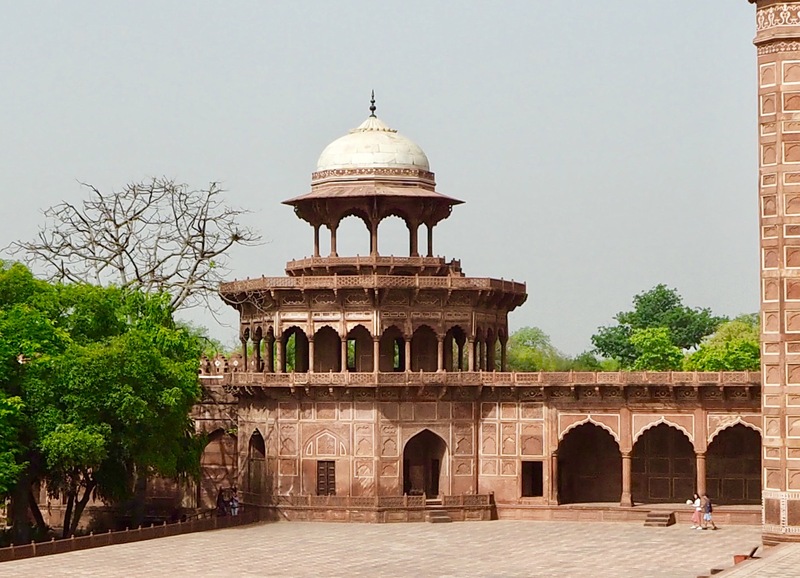 If you haven’t journeyed to Agra yet, make sure you put it on your Bucket List and spend a day, or longer, soaking up the history and magnificence of this amazing place. And with incredibly low airfares to India offered by Scoot Airlines, I know I’ll return one day to stand in front of the Taj Mahal again. And again, a huge Thank You to Mohinder Singh from the Amritsar Diocese for being there for us every step of the way. 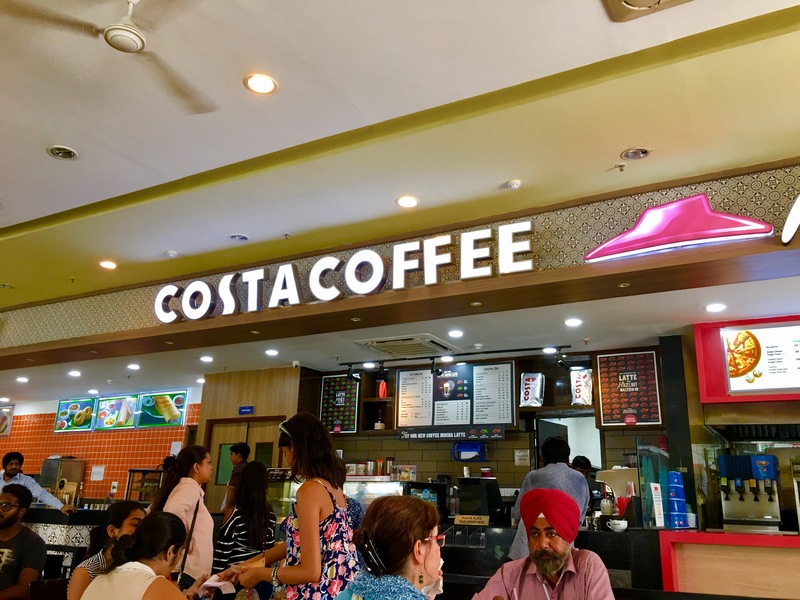 From meeting us at the New Delhi Station on our arrival from Shimla, to being our guide at the Taj Mahal, and then helping us negotiate a better price for the souvenirs that were bought along the way back to the bus.